Forget the winter doldrums! 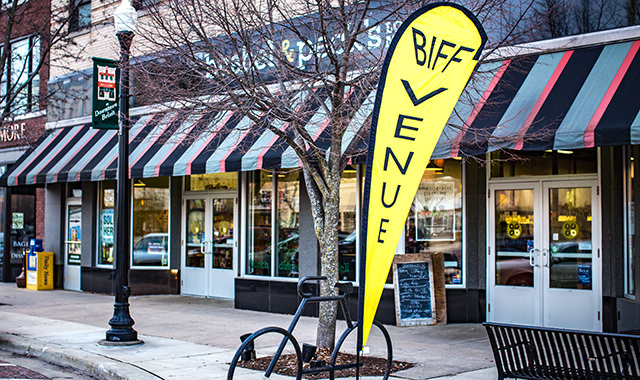 The Beloit International Film Festival (BIFF) is fast approaching. Now starting its 14th season, BIFF is a film lover’s dream: 10 days of excellent-quality films rarely seen in local theaters, an opportunity to soak up the imagination and vision of innovative, thoughtful directors, and musical performances in intimate settings. From Friday, Feb. 22 through Sunday, March 3, the 2019 BIFF season focuses on “Women in Film,” bringing not only films that portray strong women but also those directed and produced by women, a broad scope represented in the 104 films juried and selected for screening in several categories: narrative and documentary features, and narrative and documentary short films including animation. The jam-packed film schedule promises to fill the five major screening locations: Bushel & Peck’s, Bagels & More, the Hendricks Center for the Arts, La Casa Grande and Domenico’s, as well as the Beloit Public Library, the Beloit Memorial High School Auditorium and Schubert’s Luxury 10 Theatre. Chosen films undergo an extensive vetting system in which dozens of volunteers, including Beloit College students, rate the movies, says Greg Gerard, BIFF’s artistic director. This ensures that the films are consistently of high quality and interest. Gerard describes the mix of movies as about half narrative features and half documentaries, plus short films. In keeping with the 2019 theme of strong women in film, Gerard says there are three movies that stand out. In “Eternal Winter,” Soviet soldiers invade Hungary and capture young ethnic German women, transporting them to a Soviet labor camp where they are forced to work in the coal mines under inhuman conditions. “Eternal Winter” is the very first feature film about the 700,000 Hungarians whose stories remained untold for more than 70 years. “This film is intensely moving, and the cinematography is breathtaking,” Gerard says. “The Hello Girls” depicts the story of 223 women sent by the Army Corps of Engineers to France as telephone operators in 1918 to help win World War I. They wore Army uniforms and swore Army oaths. They served during the occupation of Germany and the Paris Peace Conference. The last of the Hello Girls returned home in 1920, only to be told they were never soldiers after all. For 60 years, they fought the U.S. government for recognition. In 1977, they won. Only 33 were still alive. “The Army signal corps called for volunteers from more than 1,000 operators,” says BIFF executive director Marty Densch. “The Army didn’t understand how to use the new telephone technology, but the women did. They were on the front lines, and there was one casualty. Afterward, they weren’t recognized until 1977. Upon accepting her award, one of the survivors asked, ‘When do we get our backpay?’” Two of the operators were from Green Bay and Milwaukee. A third choice, “Radium Girls,” is based on true events of the late 1920s. Teen sisters Bessie and Jo paint glow-in-the-dark watch dials at American Radium Factory in New Jersey. When girls mysteriously fall ill, Bessie stands up to the corporation in a radical coming-of-age story. “Elgin had one of those clock factories, so the story hits close to home,” Gerard says. Not all of the BIFF films focus on women, but all are engaging and promise to entertain nearly every taste in film. BIFF is more than movies, Gerard points out. Along with the outstanding collection of quality films, nightly entertainment at downtown Beloit’s many establishments draws even more participants. Legendary local trumpet musician Tony Scodwell will be joined by Freeport’s Highland Community College Big Band to perform at Suds O’Hanahan’s Irish Pub. A “Godspell” sing-along is among the festival’s highlights, and more entertainment is planned for every evening at varying locations. Gerard adds there will be a “Women in Film” panel discussion on Saturday, March 2 in the Rooftop Room gathering area at the Hotel Goodman, Beloit’s new boutique hotel. The wrap-up of BIFF 2019 is the BIFFY awards program. A full list of films and show times, plus ticket information, is available at beloitfilmfest.org. This entry was posted on Tuesday, January 29th, 2019 at 11:58 am	and is filed under Arts & Entertainment. You can follow any responses to this entry through the RSS 2.0 feed. Both comments and pings are currently closed.